San Diego Comic Con 2012 Exclusive ! Thorin, son of Thráin, son of Thrór, King Under the Mountain. A mighty warrior and noble dwarf. Thorin Oakenshield is the leader of the Dwarven expedition that hires Bilbo Baggins to steal back the great dragon, Smaug’s treasure. 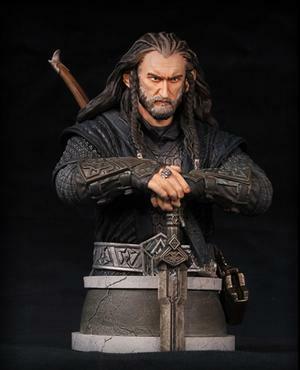 Crafted using digital scans of actor Richard Armitage, his authentic costumes and props, and cast in the highest quality polystone, no other collectable is as accurate a portrayal of The Hobbit’s Thorin. Hand painted and individually numbered, this convention exclusive is sure to be quite… precious. Don’t miss out.